IST is launching the fifth edition of the PhD Open Days with the main goal of offering the opportunity to more than 1.000 PhD students of socializing and sharing their research, skills and expertise with the rest of the academic community. We are proud to count with a set of distinct speakers as well as alumni from several IST PhD Programs. We are also pleased to receive representatives from several companies that will have the opportunity to share their professional experiences and interact with PhD students. The event includes a permanent poster exhibition with the most recent research developments made by PhD students, a Tech Exhibition, several plenary talks where top researchers present last results in cutting-edge research fields, an alumni session, a pitch competition, and a workshop devoted to help students develop their scientific writing and public presentation skills. The event includes also an informal lunch where PhD students are invited to interact and socialize with alumni and IST researchers. You are all invited to attend the PhD Open Days on April 9 and 10 at the Assembly Hall (Salão Nobre) of IST. Invited Talk - "Astrobiology: Origin and detection of life in our solar system"
Invited Talk - "Some ESA projects involving aerothermodynamics"
Invited Talk: "Robotic navigation in neurosurgery"
Zita Martins is an Astrobiologist and an Associate Professor at Instituto Superior Técnico (IST), Portugal. She works in the field of Astrobiology and Cosmochemistry, and her research interests include the detection of bio-signatures in space missions, and the potential contribution of organic compounds present in meteorites and comets to the origin of life on Earth. She has a 5-year undergraduate degree (Licenciatura) in Chemistry from IST (Portugal, 2002) and a PhD in Astrobiology from Leiden University (The Netherlands, 2007). She was an Invited Scientist at NASA Goddard (2005 and 2006), and an Invited Professor at the University of Nice-Sophia Antipolis (France) (2012). In 2009 she was awarded a Royal Society Research Fellowship worth 1 Million British Pounds, and she was a Royal Society University Research Fellow at Imperial College London (UK) until end of 2017. Since January 2018 she is an Associate Professor at IST (Portugal). Zita Martins has been actively involved in space research, including participation in several space missions. From 2007 to 2009 she worked on the Urey Mars Organic and Oxidant detector, which was previously listed to fly to Mars on the ExoMars mission. She is a Co-Investigator of two European Space Agency (ESA) space missions (OREOcube and EXOcube), which will be installed in the International Space Station. She is also a Member of the Portuguese Consortium of the ARIEL space mission from ESA, and a Member of the “Organic macromolecules” sub-team of the Japanese space mission Hayabusa2 from JAXA. Zita Martins is a Member of an ESA Topical Team (“Future Astrobiology Experiments in Earth orbit and beyond”), a Committee member of the Astrobiology Society of Britain (ASB), the Portuguese Representative of the Executive Committee of the European Astrobiology Network Association (EANA), an Expert Member of ESA Life Sciences Working Group (LSWG), and a Member of the Leonard Medal Committee of the Meteoritical Society. She has an active involvement with public outreach activities, including more than 100 international media interviews, and public talks at museums and Science festivals (more details e https://fenix.tecnico.ulisboa.pt/homepage/ist31684). She had the honour of having her portrait sketched (special commission) for the Royal Society exhibit about successful women in science. She was selected by the BBC as an Expert Women Scientist, and as one of “100 Women in Science” by the Portuguese Agency of Science and Technology “Ciência Viva”. In 2018 she received a Barbie Award 2018 on the International Girl Child Day for being an inspiration to girls. In 2015 Zita Martins was appointed Oficial da Ordem Militar de Sant’Iago da Espada (OSE) by the President of Portugal for exceptional and outstanding merits in science. Jorge de Brito is Full Professor in the Civil Engineering, Architecture and Georresources Department of Instituto Superior Técnico, University of Lisbon, Portugal. He is the Director of the Eco-Construction and Rehabilitation Doctoral Program from FCT. He is co-coordinator of CIB W80 (Service Life Prediction) and the coordinator of CIB W80 (Building Pathology). He is Editor-in-Chief of the Journal of Building Engineering. He was the recipient of the UTL 2011 and UL 2016 Scientific Productivity awards. Over the last 20 years, he has been actively engaged in the edition, reviewing and writing of papers in international peer-reviewed journals. João Ramôa Correia is Full Professor at the Civil Engineering Department of Instituto Superior Técnico (IST), University of Lisbon. He holds a 5-year degree in Civil (Structural) Engineering, a MSc in Construction and a PhD in Civil Engineering. He teaches courses related with Construction Technology and Building Pathology and Rehabilitation. He coordinates a research group (CORE Lab) at IST, which conducts research, development and teaching activities on advanced fibre-reinforced polymer (FRP) composite systems for civil engineering applications. The main research areas of the CORE Lab are the mechanical behaviour of FRP composites systems, connection technology, long term performance, durability, fire behaviour and sustainability. João Ramôa Correia is member of the Editorial Board of Journal of Composites for Construction (Associate Editor), Composite Structures, Fire Safety Journal and Advances in Structural Engineering (Associate Editor). In 2012, he was the recipient of the IABSE Prize and in 2016 he received the IIFC Distinguished Young Researcher Award. Herculano Carvalho is an experienced Neurosurgeon (MD 1988) with practice at Hospital Santa Maria in Lisbon, Hospital da Luz and Centro Oncológico Natália Chaves. Dr. Herculano’s practice focuses on functional neurosurgery, stereotaxy and neuronavegation, intracranial tumor neurosurgery, brain radiosurgery and spine surgery. Jorge M. Martins is Associate Professor at the Department of Mechanical Engineering at Instituto Superior Técnico, Lisbon, with a PhD in Mechanical Engineering (2007) from IST. His scientific research is done at IDMEC and his interests focus on the design of robotic devices for physical Human Robot Interaction – pHRI. They branch into robotics, modeling, simulation and control, in particular variable impedance control, biomechanics, muscle actuation and human motor control. The underlying approaches of his work are the development of probing experiments for human body function, in order to better understand its control mechanisms and model its dynamics, and the bridging of this knowledge into new designs, models and controllers for pHRI. He has founded the Surgical Robotics Lab at the Department of Mechanical Engineering of IST, where he coordinates collaborative research projects on assistive robotic technologies for neurosurgery, orthopaedics and urology. Lionel Marraffa has received a Master degree (1978) and PhD (1992) at Ecole Centrale de Paris (ECP). He has retired in December 2018. He started his aerospace career in 1979 at ONERA (France), until 1990: he conducted hypersonic flow modelling studies when staying as Visiting Scientist at UT Austin and Pennsylvania State University (USA) from 1985 to 1987, continued at his return by contributions to HERMES program (test facilities design). 2013-2014: Project Manager Mini-Irene deployable entry capsule. Development of the capsule, preparation of a flight test. 2008-2011: study manager for In-Flight Research on Ablation-Radiation coupling with Astrium and Thales-Alenia Spazio: two parallel designs of RADFLIGHT, a high-speed entry capsule. Then responsible for the preparation of PHOEBUS project, based on the lessons learned. 1998-2005: System engineer then Project Manager, Inflatable Reentry and Descent Technology Demonstrator (IRDT) launched from a Volna converted ICBM. Entry capsule based on an inflatable ablative TPS concept developed by Lavochkin (Russia). Low budget (less than 5 M€), 4 test launches. First test of an inflatable heat shield for atmospheric entry. 2002- 2007: AURORA support. Participated to the definition and first steps of the program. Proposed and led pre-phase A studies for ExoMars and for Aerocapture Demonstration Mission at the Concurrent Design Facility (CDF). 2014-present: Deputy project manager for DOC, a small observation hypersonic reentry capsule for VEGA upper stage entry. 2010 – Present: Initiator and responsible for the development of a kinetic shock tube. A new facility is developed at IST (Portugal) for a limited budget. Will allow tests at more than 10 km /s. o 2008 – Present: Proposed and implemented the upgrade of SCIROCCO plasma wind tunnel: After a rather simple modification, heat fluxes will reach 20 MW/m2 . 1992-2000 : Aerothermodynamics support and system engineer for induction (VKI Plasmatron), and arc heated (SCIROCCO at CIRA) plasma wind tunnel development and commissioning. Future Launchers Preparatory Program: project manager for the first large scale production of the densified fuel with Magna Steyr in Austria. System engineer for the first microgravity experiment with cryogenic fluids on a TEXUS rocket. On the technology and research side, Lionel Marraffa has initiated and has been chairman of the international workshop on Radiation of High Temperature Gases in Atmospheric Entry, from 2002 to 2016, and has been leading 23 research programs for ESA or the European Commission. He has published 96 conference articles and 25 papers in international journals. Luis is currently the Business Development Director at Critical Software responsible for the Transportation and Medical Devices markets, part of the company’s High Integrity Systems Division. In addition he is currently the Managing Director of Critical Software GmbH, Critical Software’s branch in Germany. Luis joined Critical Software in 2011, initially working as a project engineer in the area of real-time embedded systems. In this role he participated in the development of ESA’s Sentinel 2 earth observation satellite, among other small projects. He then started to perform business development functions initially for the aerospace market and later as the responsible person for the Railway and Automotive market segments, focused on developing Critical Software’s client base in these areas. Before Critical, Luis was following an academic career. He finished is 5 year degree in physics at Instituto Superior Técnico in 2004, and a Ph.D. in Physics also at IST (IPFN/GoLP) in 2009, working in the subject of space plasmas and high performance computing. During his Ph.D., Luis worked mostly on theoretical aspects and on computer simulations of space plasmas at IST, and in close collaboration with the Rutherford Laboratory in the UK. After his Ph.D.
he also spent 2 years as a post-doctoral researcher in the department of Astrophysical Sciences of Princeton University. Sabina is a Research & Development Specialist at NOS. She has a bachelor’s and master’s degree in Telecommunications from University of Sarajevo, and a dual Ph.D. degree in Electrical and Computer Engineering from Carnegie Mellon University and Instituto Superior Técnico. Sabina has over 15 years of experience in Telecommunication Industry and Data Science related research. Currently, she works on developing machine learning models for improving customer satisfaction, and enjoys solving real world problems with algorithms. Filipa has a degree in Chemical Engineering, a Master’s degree in Biochemical Engineering and a PhD in Bio / Nanotechnology in the development of DNA chips, and has also attended the Lisbon Medical School. Her professional career is characterized by a strong presence in areas related to technology and health management, currently collaborating with the European Commission in the areas of ehealth. David Henriques holds a PhD in Mathematics and Computer Science from IST (2016). He is currently in BNP Paribas, heading a team – Analytics Consulting Lisbon – of 28 awesome Data Scientists, Data Analysts, Data engineers and Data Visualization Developers. Together we develop Business Intelligence and Artificial Intelligence Solutions for our clients at BNP Paribas CIB. Rui Franco (1967) is graduated in Electrical Engineering and Computer Science by the Technical University of Lisbon. Along his career, he has concluded several other courses in the area of technology and management namely a post-graduation in General Management by Universidade Católica Portuguesa (UCP) and an Advanced Management Program jointly organized by UCP and Kellog School of Management (Chicago). Since May 2011 he is the Managing Director of RENTELECOM the telecoms and IT provider of REN Portuguese energy group. He started its career in 1989 Telecom Portugal (now Altice). He entered Marconi (Portuguese telecoms carrier) in 1990 and, along 7 years, he held different responsibilities in technical and business areas, namely as Regional Director in charge for the European market. In 1998, anticipating the opening of the telecoms market to competition, he joined the founding team of Oni Communications, the utility based fixed line alternative operator. At Oni he had different management positions including being the founder and General Manager of the Wholesale Business Unit of Oni. From 2008 to 2010 he was Chief Sales Officer for T-Systems (Deutsche Telekom) in charge for launch in the Portuguese market. From 2010 to 2011 he was the Partner in charge for the launch of NAE (Spain based ICT consultancy) in the Portuguese market. He greatly values mentoring, education and sales management – he is a professor of Sales Management at IDEFE/ISEG post-graduation in Lisbon. Happily married and a father of two boys that have also chosen the path of engineering. Ivo Vieira holds a PhD in Physics Engineering and a MBA from Lisbon MBA programme. He participated in PoSAT-1, first Portuguese satellite in middle 90s in a Space Research Office at INETI. From 1997 to 1999, he was missionary in Mozambique (Africa) giving lectures on physics for a pre-university school. He was the vice-director of the school and was one of the main responsible for creating it from the beginning. In 2000, he began a PhD on plasma propulsion and thus introduced this new field in Portugal. Additionally, from 2000 to 2003, he was SSETI coordinator in Portugal, namely on the AOCS subsystem of ESEO spacecraft. In 2002, he created LusoSpace, a Portuguese company related to his past and present experience. Then in 2013 he created LusoVU and LusoMusic, focused respectively in Augmented Reality and Gaming for music training. Since 2012, he is business angel of SelfTech and Turflynx startups. Francisca is currently the Director of Training, Research and Innovation at Luz Saúde, where she leads the implementation of a cutting-edge simulated hospital at Hospital da Luz Lisboa, integrating advanced training of health professionals, translational and clinical research in collaboration with leading research and academic institutions, and internal and external innovation. Francisca was previously a consultant at McKinsey & Company in Lisbon, where she worked in different sectors and functions, including an internship at the McKinsey Hospital Institute (MHI) in London, UK. Francisca has a degree in Engineering Physics from Institute Superior Técnico (IST) and holds a PhD in Medical Engineering and Medical Physics (MEMP) from the Massachusetts Institute of Technology (MIT). She attended the Harvard-MIT Division for Health Sciences and Technology (HST) combining MIT science and engineering courses with the ﬁrst two years of Harvard Medical School clinical curriculum, and a clinical rotation. Francisca conducted research on fMRI of the awake behaving monkey at the Harvard/MIT/MGH Athinoula A. Martinos Center for Biomedical Imaging. Matilde Marques was born in Santarém, Portugal. She holds B.S. and Ph.D. degrees in Chemical Engineering and a Habilitation degree in Chemistry from Instituto Superior Técnico (IST), University of Lisbon, Portugal. She conducted postdoctoral work in Chemical Carcinogenesis at the FDA National Center for Toxicological Research, USA, and is currently a full professor at the Department of Chemical Engineering of IST, where she teaches Organic and Medicinal Chemistry. She coordinated the M.S. and Ph.D. Chemistry Programs at IST until December 2016 and is currently vice-chair of IST’s Scientific Council. Her research focuses on the mechanisms of toxicity induced by environmental (e.g., aromatic amines, acrylamide) and therapeutic (e.g., antiestrogens, anti-HIV drugs) xenobiotics, on the development/validation of analytical methodologies for the detection and quantitation of biomarkers of exposure to toxic agents, with emphasis on mass spectrometry-based methodologies, and on the design, synthesis, and biological evaluation of potential therapeutic agents. She is a Member of the American Association for Cancer Research, the American Chemical Society, and the Royal Society of Chemistry. She currently chairs the Division of Medicinal Chemistry of the Portuguese Chemical Society and is Council Member of the European Federation for Medicinal Chemistry (EFMC). She serves on the Editorial Advisory Board for Chemical Research in Toxicology, and has been a Member of multiple working groups for the International Agency for Research on Cancer. Ana is a Full Professor in Operations and Logistics, at the Engineering and Management Department of Instituto Superior Técnico (IST), and she holds a PhD from the Imperial College of Science Technology and Medicine. She coordinates the PhD program of Engineeringf and Management at IST. Her research focus on developing a comprehensive understanding of a variety of problems in supply chains and operations management, supported by novel engineering systems models and techniques. Sustainability, flexibility, design and planning of supply chains are among the main addressed issues. She has created the research group in Operations Management and Logistis (OpLog) at IST where research is focusing on developing sound theoretical concepts with a close connection with industry. Ana has published widely in international journals and has participated in a large number of conferences where she has presented several plenary lectures. Her work develops in closed collaboration with leading companies from a variety of different industries in the decision support and optimization of their operations. 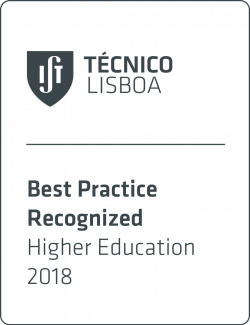 Her research lead to the award of national and international prizes having received twice in recent years the honour of being considered the best researcher in Industrial Management at the University of Lisbon. Ana is a founder member of the Euro Working Group in Sustainable Supply Chains (EWG-SSC) of the European Association of Operational Research and is currently part of the coordination team. Its core competencies and areas of action are Strategic Management, Business Development, Organizational Performance Management, Location Intelligence, Process Definition and Reengineering, Marketing, Social Media, Social Communication and Collaboration, Enterprise Communication and Collaboration. Nuno Nunes is a Full professor at Tecnico U. Lisbon and the President of the Interaction Technologies Institute (ITI) a research unit of the LARSYS Associated Laboratory. He’s also co-Director of the Carnegie Mellon International partnership (www.cmuportugal.org) and adjunct faculty at the HCII at CMU. Nuno’s research interests lie in the application of models to software, system and service design for the domains of environmental sustainability and participatory culture. Nuno is a strong advocate of the role of design in engineering. Nuno organised several key conference of the ACM SIGCHI (www.sigchi,org) and published more than 140 peer-reviewed papers in international journals and conferences in the areas of software engineering, HCI and service science. He was PI and co-PI of several research projects totaling more than 12M€ from European to nationally and industry funded.